As a part-time linguist (not my official job title) and as a lifelong speaker of the language, I have come to find that English is anything but normal. Conveniently enough, this is evidenced by the fact that—between British English (BrE) and American English (AmE)—the "state of being normal" is the precise definition of two separate words: normality and normalcy. The former is the variant used almost always by speakers of BrE, while American English speakers continue to sometimes use the latter. I say "sometimes," because, actually, it should be noted that normality is still the most predominantly used variant of the two in the United States. However, as you can see from the Ngram below, its use is rapidly declining—so much so that, if current trends continue, normalcy will overtake its counterpart in the next 30 years. So frequently is it used in American English, in fact, that speakers of British English sometimes like to deride Americans for "butchering the language"—a phrase (or variation thereof) that is also used in relation to words like soccer, aluminum, and pants. However, while I have previously defended American English for its use of those three words, the growing popularity of normalcy might, in fact, have its roots in one man's misuse of the language. And not just any man: the 29th President of the United States. Warren G. Harding was a post-war president. Various polls conducted since his death in 1923 have been almost unequivocal in their evaluation of Harding as a president: he was one of the worst in the nation's history. Aside from widespread corruption and scandals marring his presidency, Harding was also known for the occasional misstep when it came to his oratory skills. 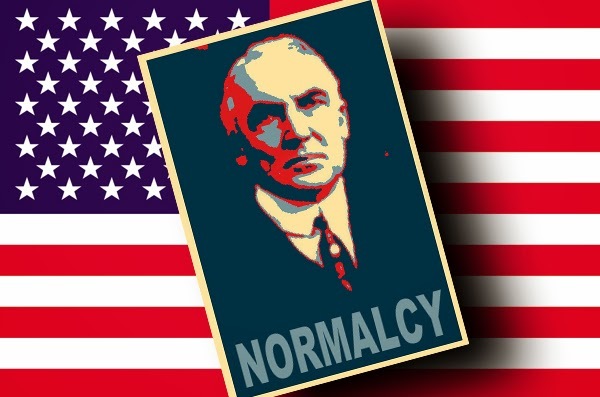 The flagship campaign promise of Harding during his election campaign had been the return of a pre-war national mentality—summed up by the phrase a return to normalcy. At the time, Harding had been derided by the press for inadvertently "coining" a new word as a malapropism in place of the word normality. In truth, the word normalcy is first attested as early as 1857. Harding swiftly defended his usage of the term, saying, "I have noticed that word (normalcy) caused considerable news editors to change it to 'normality'. I have looked for 'normality' in my dictionary and I do not find it there. 'Normalcy', however, I did find, and it is a good word." That said, etymologists believe that prior to Harding's usage, normalcy had largely only been used in the mathematical sense—in other words to mean "the mathematical condition of being at right angles." Which word do you say, NORMALITY or NORMALCY? Let us know in the comments below. This article was written by Laurence Brown. Laurence is a British expat living in Indianapolis, Indiana. He is a contributor for BBC America and has written for Anglotopia. He is Editor-in-chief of Lost in the Pond and loves nothing more than to share these articles with anglophiles, expats, and other interested parties on social media. Follow Lost in the Pond on Facebook, Twitter and Google+.